O Tannenbaum was a teaching piece last year at the Shepherd's Bush Retreat. It is now available for re-release! pretend you are stitching one piece and stitch as such. In other words, cut and tape the 5 pages of the chart together, overlapping the gray areas. (see below photo of chart) The stitched sections do not get cut apart until all 5 are stitched. I recommend doing a center start. Once you have the chart pages set side by side, it will be clear how they get stitched on the 9" x 26" cut of linen. This layout is to best accommodate the cut of linen, with the least amount of waste. It also allows you to work with a larger piece of linen, rather then small cuts that make our hands tired, or don't fit into our hoops, etc. ;) NOTE - You will see that 2 of the sections lay on the linen side ways (page 1 & page 3), that is correct! Just turn both your linen and chart, so they read correctly, when you stitch those two sections. Hope this helps & enjoy! the holiday cross stitch for 2017! 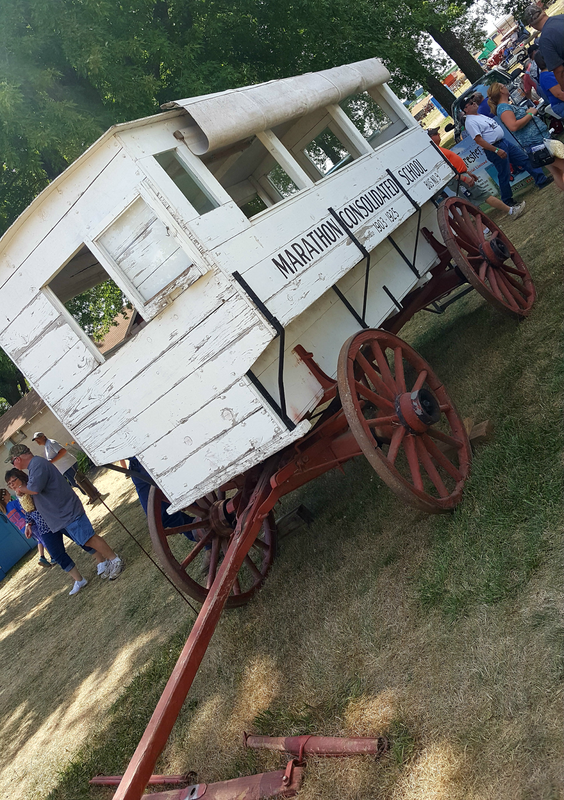 Yesterday we drove to a rural Iowa farm that hosts a threshing bee each summer. 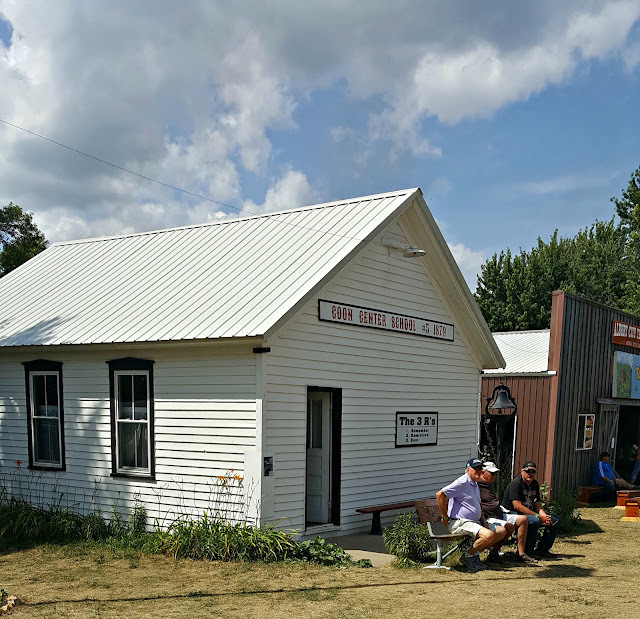 It was a beautiful later summers day to take in the large steam engines, saw mills, stone grinding flour, broom making, farm machinery pulled by teams of horses, black smithing and Civil War reenactments. 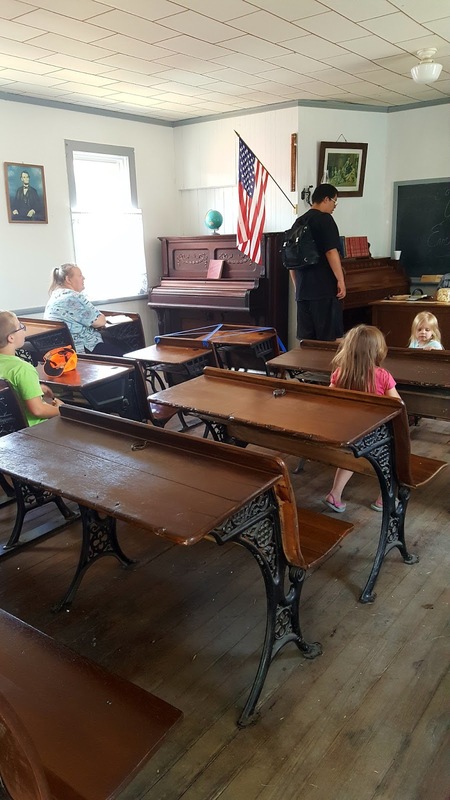 One of our first stops was the one room schoolhouse. Since I am in the midst of the Summer Schoolhouse ~ Lessons in Abecedarian series I just had to snap a few pictures with my phone to share with those of you who are stitching this series. When you enter the school house there is a narrow little hall way to the left of the door. 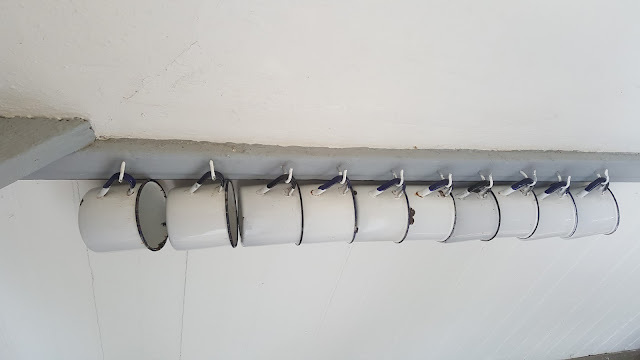 In the corner on a shelf sits a enamelware pitcher and ladle and on the wall a row of cups. The image of these cups just stopped me in my footsteps, it gave me goosebumps. Such a simple photo, yet speaks volumes of school days of yesteryear. My sisters who are 8 and 10 years older then I both went to a one room country school house. They went through grades 4 and 6. The neighbors would take turns driving the kids to the country school. In the spring time they would ride their bikes. 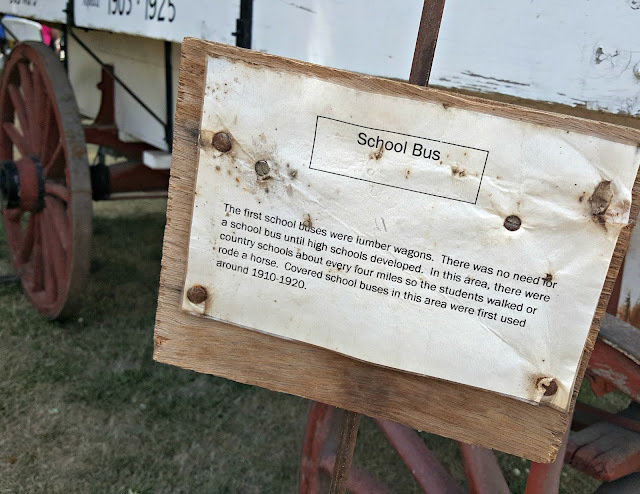 The kids would all meet at the corner and then ride the country roads together, as a group, to the schoolhouse. The school did have a phone and my sisters said it only ever rang one time. It rang on the day President Kennedy was assassinated. It was the teachers husband calling to tell her the news. It's a memory of complete silence by the teacher and students my sisters will always remember...10 students. One room school house which housed K - 6th grade. One teacher taught all grades. She was the math teacher, the reading teacher, writing teacher & the music teacher, too! 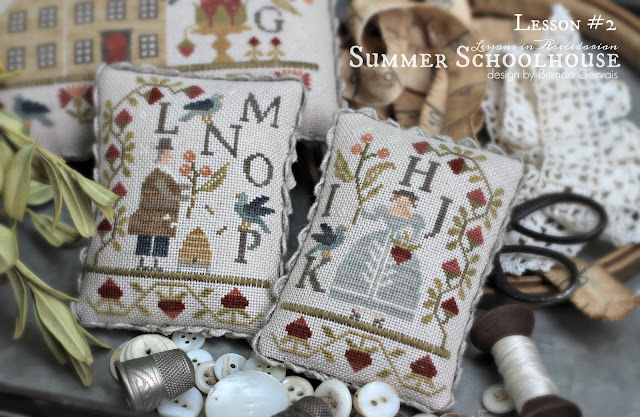 I leave you with a peek at X, Y & Z the final lesson from Summer Schoolhouse ~ Lessons in Abecedarian series. 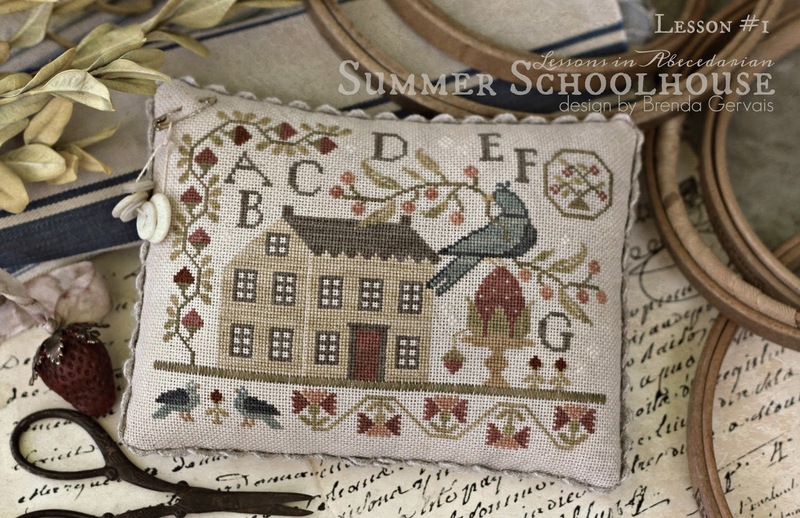 This has been an absolute delight to bring to all who have joined in ~ thanks for spending your summer stitching with me! It's time for Lesson #2 of the Lessons in Abecedarian Summer Schoolhouse Series! I am reading on various social networking sites that this series is your first experience with working over 1 thread. This makes me so happy. The little extra time that it takes to adjusting to this "tiny work" is so rewarding, the end results are beautiful. 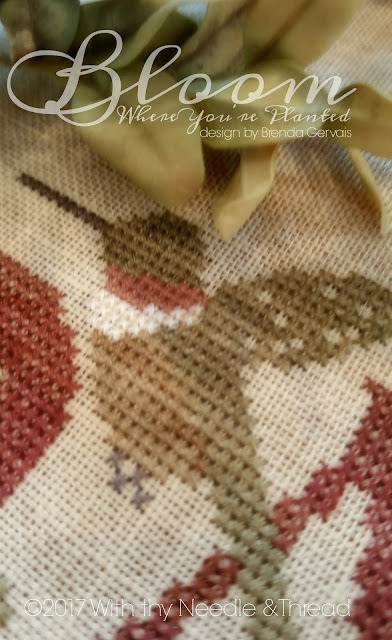 Once you master the tension of the stitch, along with some repetition, you become much more proficient in stitching. 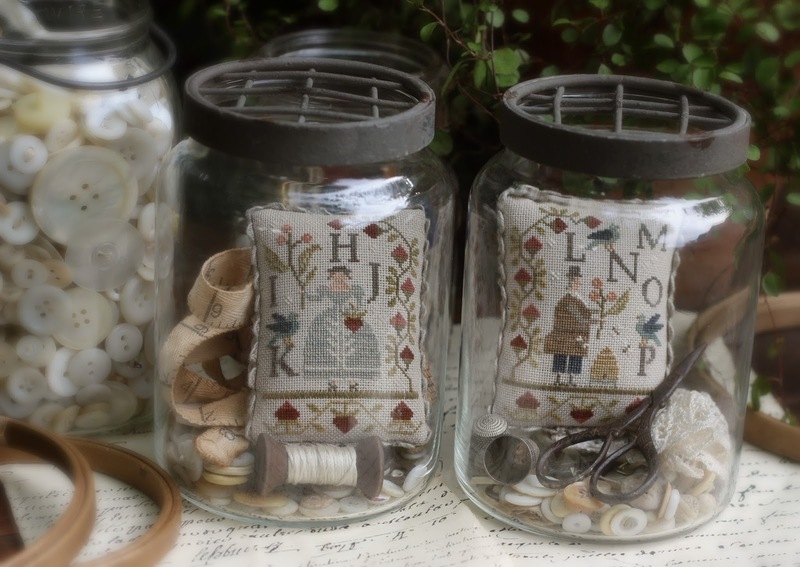 These tiny little pillows tuck so sweetly into a glass jar filled with buttons,scissors, old thimbles or any other stitching goodies you may have. The smallness of these are hard to capture in a photo. They measure just 3" tall. Lastly, Lesson #2 has it's own Needle Nanny's to keep your needles safe & secure. Watch for the patterns to start arriving in your LNS around the 1st of August. 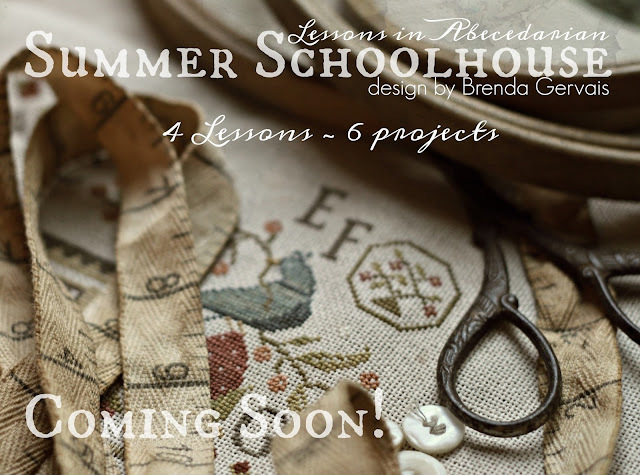 Summer Schoolhouse ~ Lessons in Abecedarian has released and they are on their way to your local needlework shops, as I type. The conception for the idea for the Summer Schoolhouse ~ Lessons in Abecedarian lies within the pages of this little old book from the 1940's. I opened it up and began to read. Intended for the instruction and amusement of Little Master Tommy, and Pretty Miss Polly...and so on. Then I read this...A ball and pincushion: the use of which will infallibly make Tommy a good boy and Polly a good girl. A pincushion? Did I just read pincushion? My heart may have skipped a beat! I needed to learn more about this little old book that talks of a pincushion. I began to do some research. 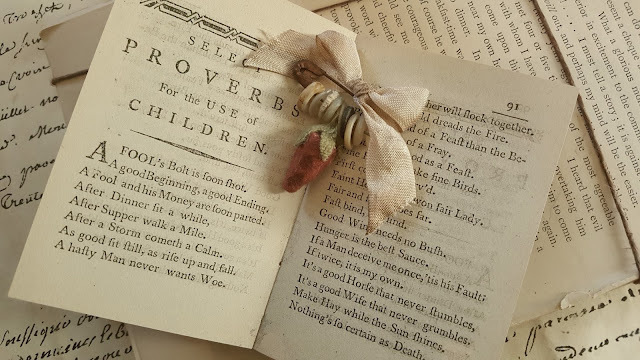 The original book was written in 1770, in London, by John Newbery, a prominent publisher of children's books. 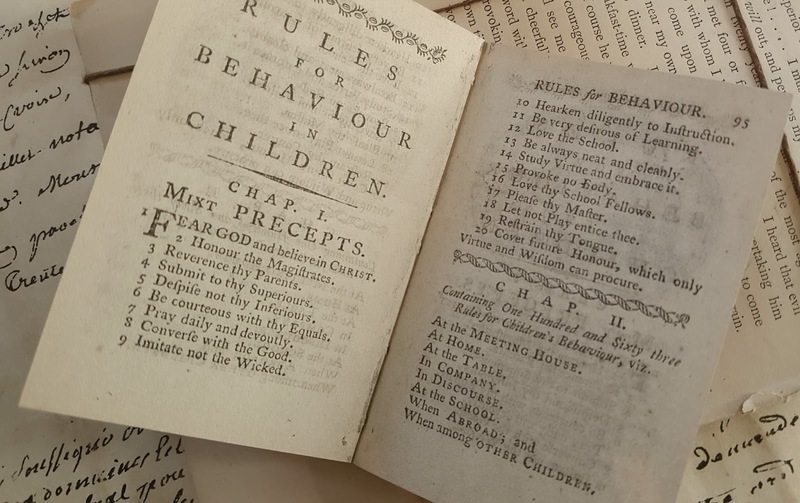 The book was considered to be the first book specifically directed at children. Hold onto your britches & garter straps, my findings are about to get good! The book was originally sold with free gifts. Free gifts? A ball for a boy and a pincushion for a girl. How cool is that? I want to learn what the pincushion looked like, don't you??!! To date, I haven't located any photos of the pincushion. The original book was black on one side and red on the other and good deeds were to be marked by a pin stuck on the red side and bad ones by a pin in the black. The book is noteworthy for containing the first documented use of the word "baseball'. It is the oldest children's book in the Library of Congress collection and is considered to be the first children's book in print. 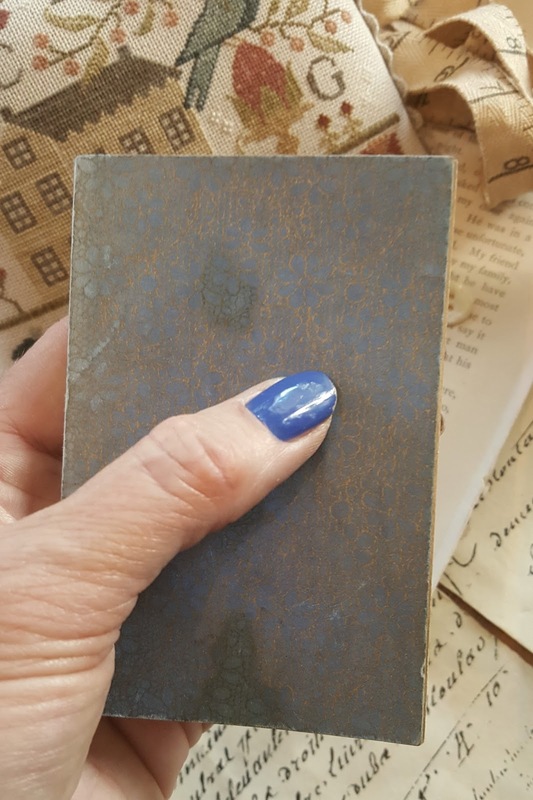 If you happen to visit the Library of Congress, look this tiny book up! 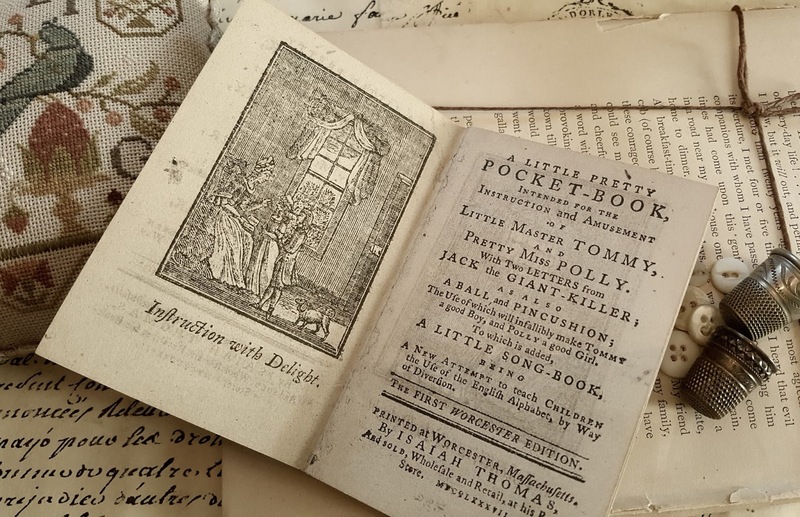 My little book is a facsimile of the original which was issued by F.G. Melcher on the 10th of June, 1944, on the 200th anniversary of the book's first appearance. 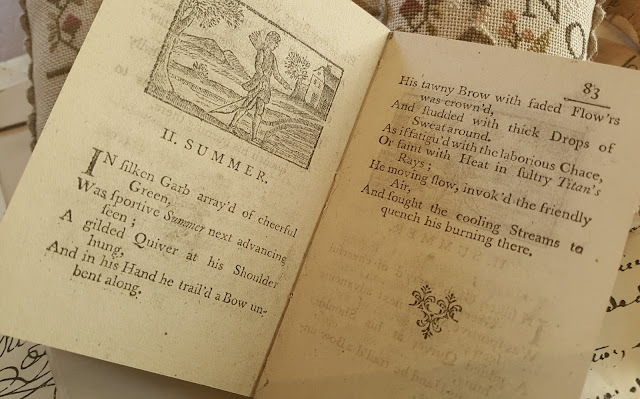 The first American edition was published by Isaiah Thomas at Worcester, Massachusetts in 1744. I wonder why the American publisher didn't go with the red and black cover as the original? As you read, you will note the use of the letter f and double f's in place of the s, this is characteristic of 18th century handwriting. Upper case letters were used to begin nouns as well as begin sentences. The lower case s was written in long s (elongated form), at the beginning of a word, in the middle of a word, and written twice. The elongated s can be mistaken for an f.
Little rhyming stories for the letters of the alphabet fill the pages of this tiny book. They read...Great A,B and C and tumble down D, the cat's a blind buff, and she cannot see. Great E, F, and G come here follow me, and we will jump over the Rosemary Tree. It was these pages that got my creative juices flowing. Wouldn't it be fun to do a series around the alphabet? Learning the letters and stitching have long been associated, why not? I charted the alphabet to look similar to the alphabet font used in the pocket book. Since the book is so small I wanted the Summer Schoolhouse series to be small, or tiny work ~ as I call it The series is meant to be worked over 1 thread on 28 count fabric. Many of you stitchers have emailed me just to let me know this is will be your first experience at working over 1. Just like a student, learning something new...that's great! Stitching over 1 thread on 28 count fabric looks more like a painting then stitching, it is extraordinarily wonderful! 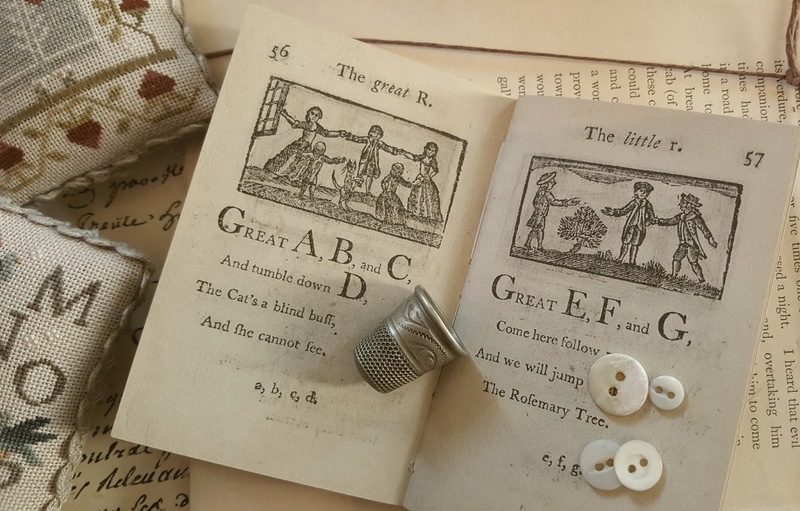 Here you can get a perspective how tiny the book is with the use of the thimble and buttons for comparison. 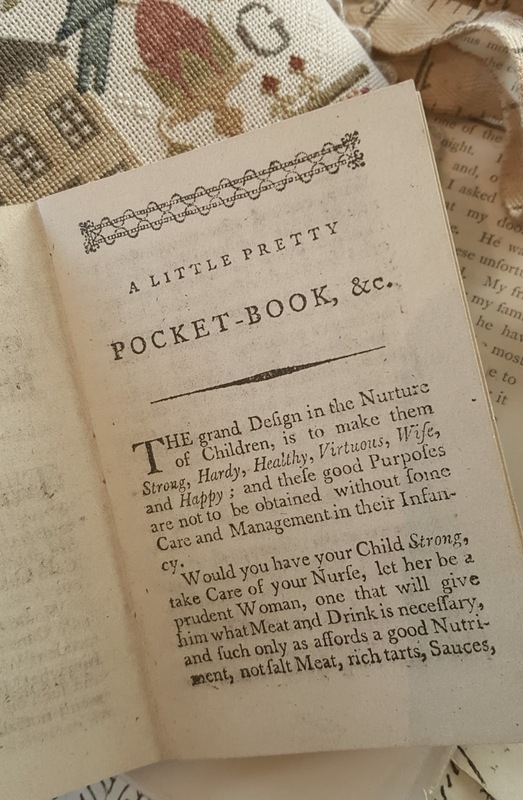 The book measures 2 1/2" x 3 3/4". Inspiration can come from strange places sometimes! Are you a student of this series? If not, there is still time! Gather up your "school supplies" and come along! Come spend the summer stitching with With thy Needle & Thread! The series will consist of 4 charts/lessons with 6 projects. All 6 of the Abecedarian-themed projects will coordinate, making for a great display. All pieces are what I call "tiny work", or worked over 1 thread on 28 count Laguna. 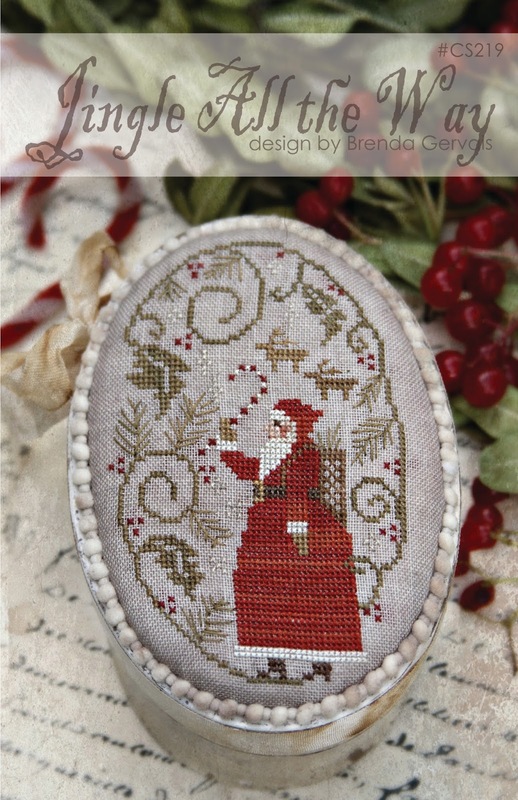 This will be a great motivator for those to try over 1 stitching! 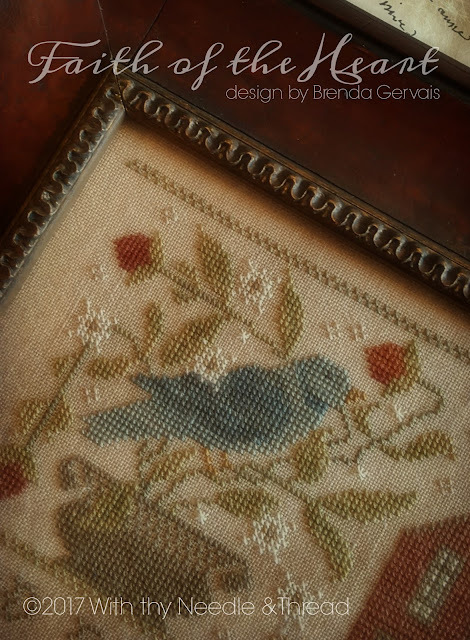 It is very do-able on this chosen even weave linen with it's big holes. Don't say you can't do this, you can! You are looking for the same holes in the same linen whether you are working over 2 threads or 1. Shops are now taking sign ups for this series. Many of them are kitting the series up for you. The series is being treated as a Mystery Stitch, only snippets of each lesson will be shared as we go along with the series. Watch for Lesson #1 to start arriving in stores end of June/early July. The following 3 lessons will release each month thereafter, ending in September. 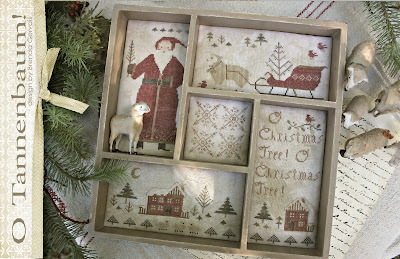 At the end of summer you can gather up all your stitching goodness in a display and feel accomplished! 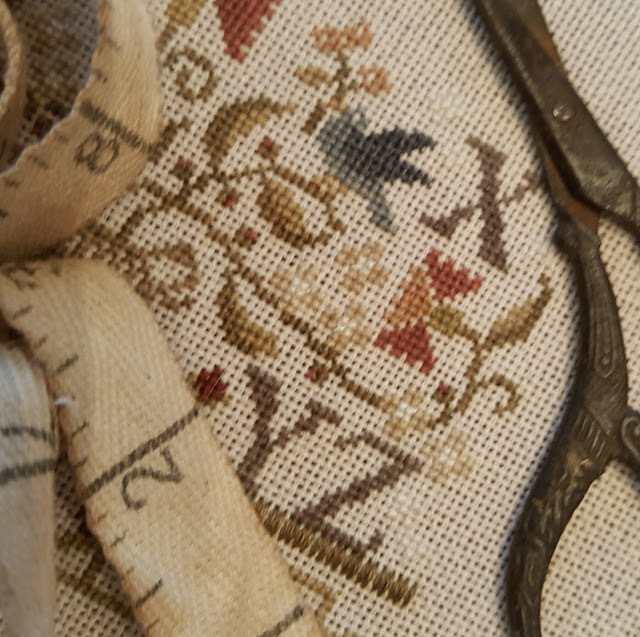 A few suggestions for working over 1 thread: Always complete your cross stitch before moving onto the next. Tension is important, don't pull your thread too tight. Suggested needle is a size 26 or 28 tapestry. Use of a hoop to keep linen taught is helpful to open up the holes even further. For smalls I love to use my little 5" Cosmo hoop. It is just the right size for these smalls. It is today's version of the hard to find antique Dutchess hoops, and I use them exclusively. Available for purchase here. 1. a person who is learning the letters of the alphabet. 2. a beginner in any field of learning. 3. of or relating to the alphabet. 4. arranged in alphabetical order. In its oldest documented English uses in the early 1600s, abecedarian was a noun meaning "one learning the rudiments of something"; it specifically referred to someone who was learning the alphabet. The adjective began appearing in English texts around 1665. Well this is it folks, the final preview of what's NEW & COMING SOON from WTN&T! Thanks for joining me each morning. If there is anything that you need to add to your stash, contact your LNS and put a little "bug" in their ear! There will also be a Limited Edition Market Kit. These will be very limited in quantity, therefore, no sneak peeks before market from me. I will let your LNS share, as they wish, on this. 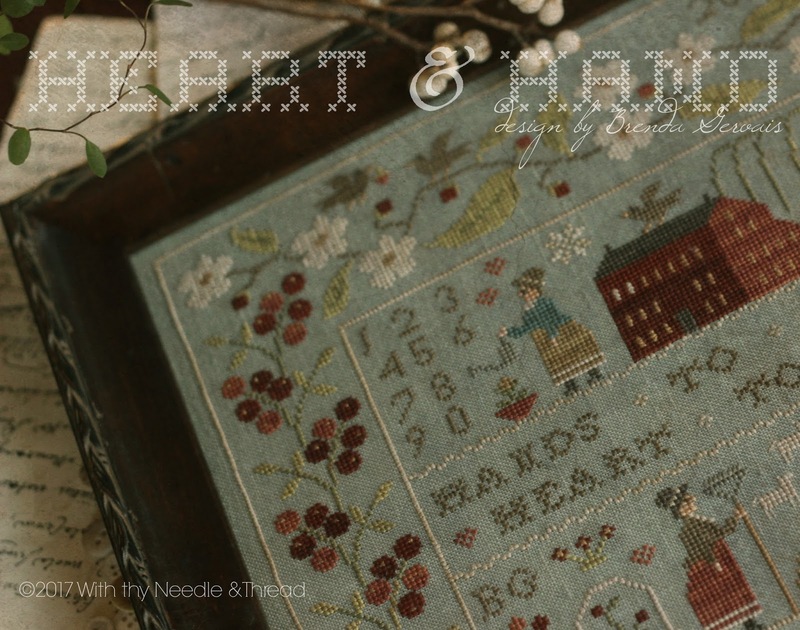 The title of the sweet little kit is "Ode to the Ort Basket". The second collection in the Essamplaire Petite Collections is especially created for all the A&E collectors! 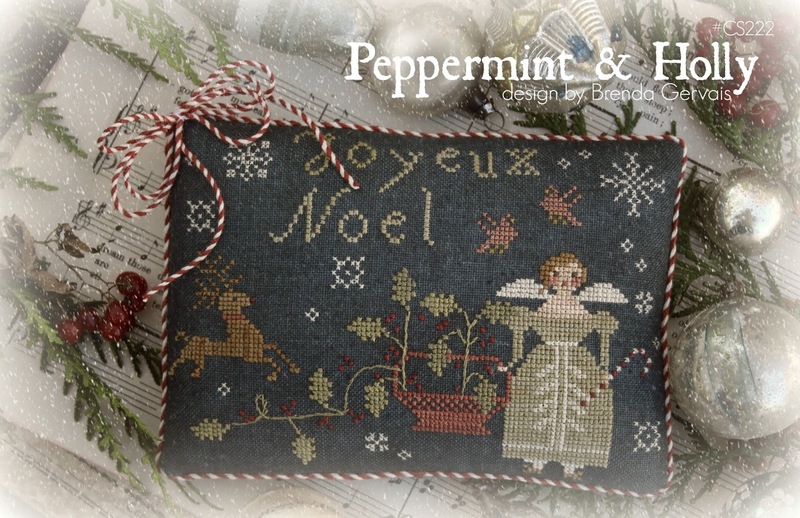 The pattern will consist of 4 tiny samplers. Once again, there is a larger (3" x 5") signature sampler and then 3 tiny (2 1/2" x 3") samplers that coordinate with the larger piece. 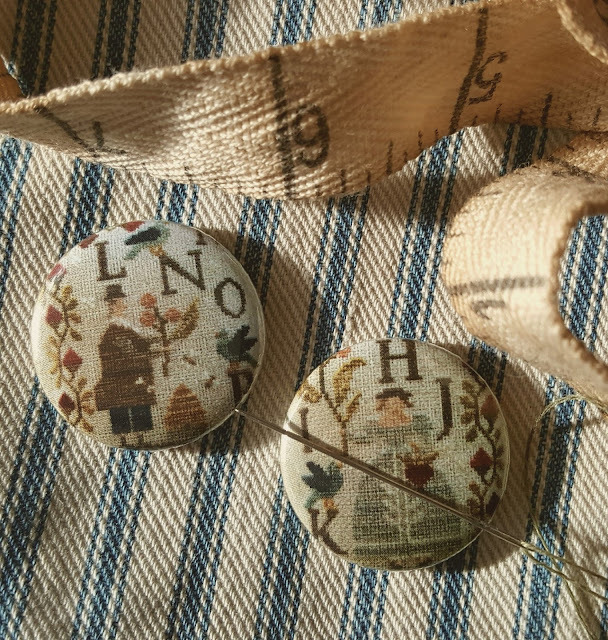 These are worked on 40 count linen over 2 threads. Frame information and finishing technique will be supplied in the pattern. Heart & Hand sampler. While all the motifs in this piece are my original, I wanted the piece to have the feel of an antique Rhode Island sampler. Floral filled urns flank a center cartouche' filled with working characters, alphabet and the heart & hand verse. The Dove blue linen really adds charm to this piece. 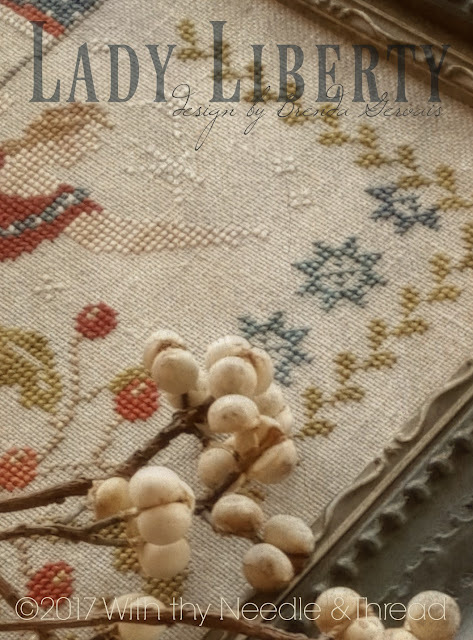 I am finding myself growing more and more fond of working with the color linens...how about you? This completes the pattern preview days. There are still lots of things to finish up and cross off my "market to-do list". Then I need to whip myself into shape...like, get a hair cut & color!! Day 3 of Market Preview! Welcome back to day 3! Each evening, for countless nights, has been spent in front of the TV packaging patterns. Tonight will mark my last night of homework...all patterns should be bagged and ready to be boxed. Are you hearing a *sigh* of relief? This piece turned out beautiful! I found a frame that really finished it off nicely. This mid-size piece features an old Chinese proverb that I have always liked, and lean on from time to time. 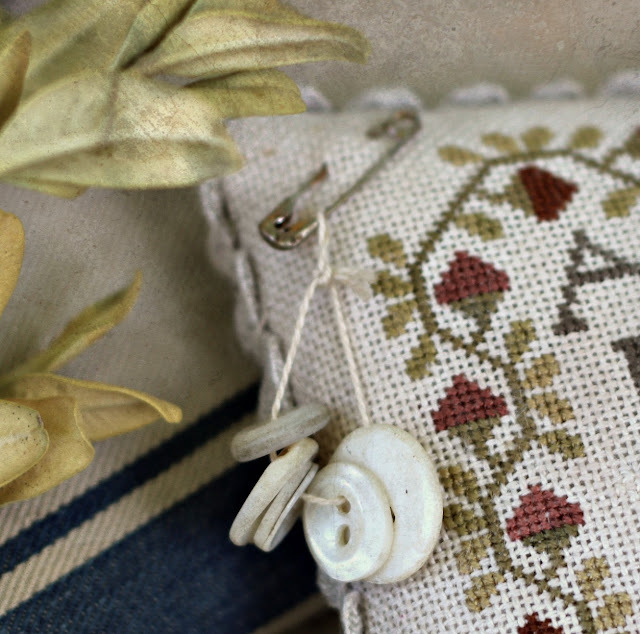 Faith of the Heart was stitched by Suzanne Garber. A special "Thank You" to this sweet & dear woman. One of my favorite things to do is to sit by my back window that opens up to my bird-feeding station. I find great solace and inspiration there. Bird migration has always fascinated me. One of my favorite guests are the little hummers as they migrate through each spring and fall. So, to them I dedicate a new pattern titled, Bloom Where You're Planted. A big "Thank You" to April Taylor for stitching this model for me. 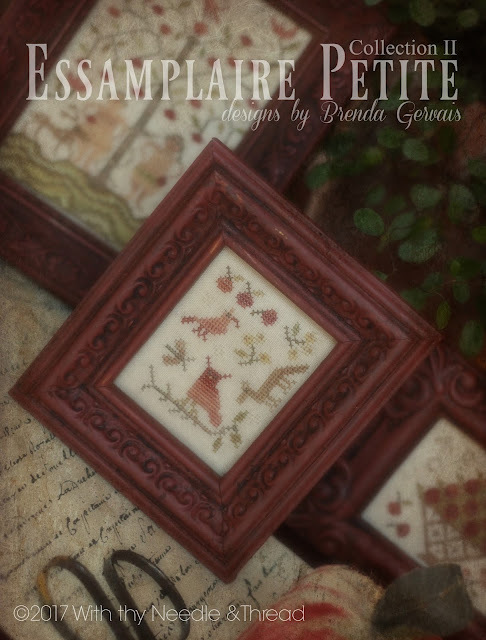 I thoroughly enjoyed designing this new collection series titled, Essamplaire Petite. This is Collection I of II. As the title states, these are petite! The collection consists of 4 miniature samplers, one being what I call it's signature piece and 3 tiny samplers that compliment the larger piece. 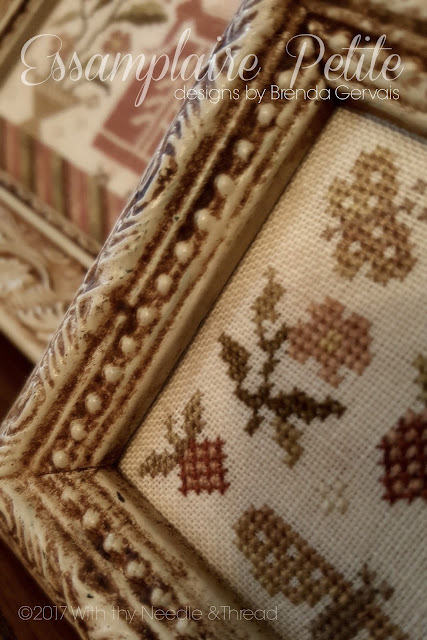 I currently have them sitting, grouped together, on my mantel in front of an antique sampler and I love the look...simply precious! The sizes of these are 2 1/2" x 3 1/2" & 3 1/2" x 5"...yep, they are tiny! I chose inexpensive frames and re purposed them a bit, all four for under $15.00. I will explain this process in the pattern instructions. Thanks for stopping by, see you tomorrow! Welcome back for day 2 of Market Preview Days! Today's shares are of 3 soon to be released charts that are smaller in size, and finished in small pillows for tucking or hanging. It's always nice to have smaller projects to work on in between larger pieces...these are perfect, little quick stitches! Oh dear, there are more mice in the house! The ever-popular mice have found their way into the sewing room. And like me, they are fond of tomato pincushions and strawberry emery's. This is one of my favorites of the mice series. 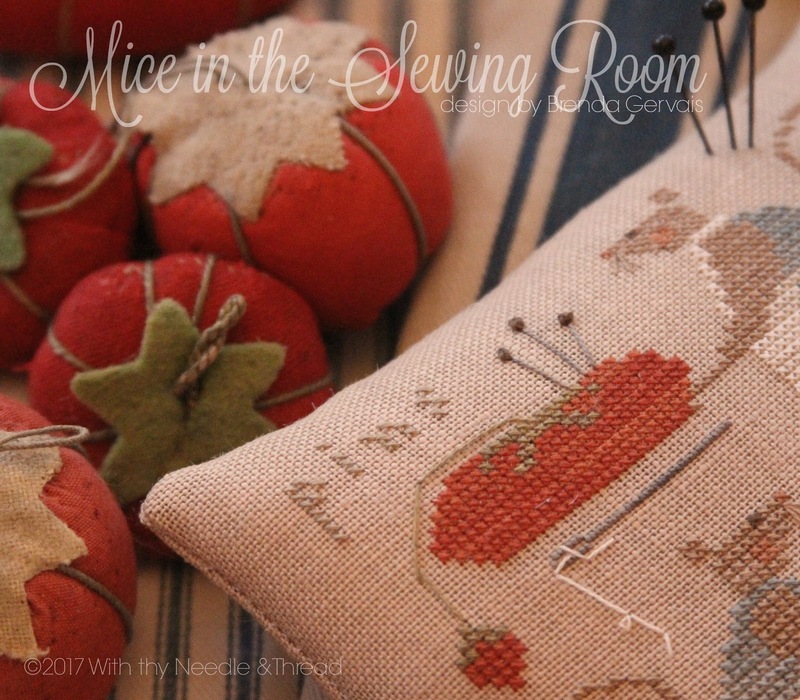 A special "THANK YOU" to April Taylor for stitching Mice in the Sewing Room. Iowa is home to two towns that are rich in Dutch heritage. Each spring they have annual Tulip Festival celebrations. There are thousands and thousands of tulips planted to bloom in time for their celebrations (that is if the weather cooperates)...it is absolutely gorgeous! There is the annual street scrubbing, with woman and children dressed in costume, before the big parade. Tulip Festival was inspired by these celebrations. 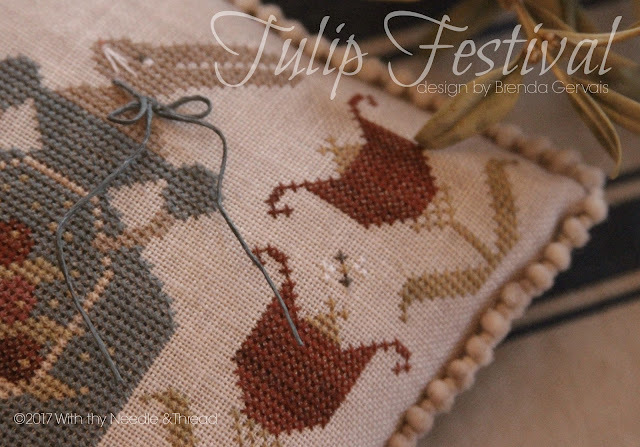 Rows of tulips, busy little bees and sophisticated rabbit motifs adorn this sweet little pillow top. Mini pom trim and dimensional bow adds extra detailing to this piece. A special "THANK YOU" to Penny Houser for stitching this model. 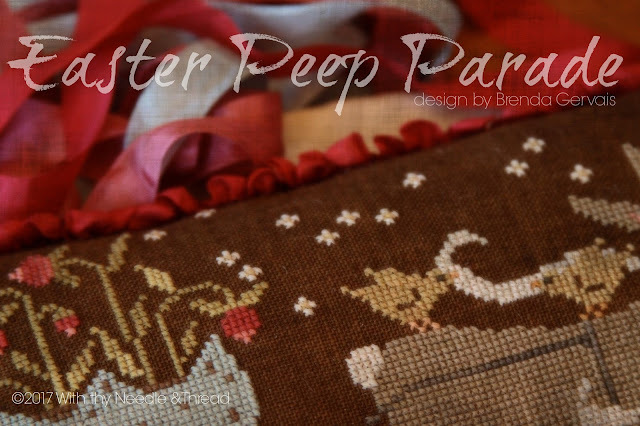 By the time I completed Easter Peep Parade, I was craving chocolate malted-milk robin's eggs and Easter Peeps! These favorite seasonal candies and an antique rabbit pull toy were the inspiration for this design. 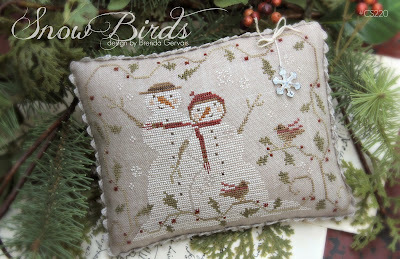 The Chestnut brown linen is becoming a favorite of mine...the floss colors really pop on it! See you tomorrow for day 3 of pattern preview week! Pardon my absence and neglect from this blog! The last several months have been busy preparing for the Nashville Needlework Market. Intense stitching and intense pattern packaging has been my life since mid October. We are now just a couple weeks away from packing up a cargo van and pushing off towards Nashville, and there is still lots to do! The van will be loaded with tables, props, models of new patterns and boxes and boxes of patterns. This is a wholesale market so watch for these patterns to pop up in your local needle work shops, for purchase, the latter part of the first week of March. With Thy Needle & Thread cross stitch charts. Our Lady Liberty, a gift of friendship from the people of France was the inspiration for this pattern. A universal symbol of freedom and democracy. I have always loved what she stands for, and it was a joy to stitch her in cloth. She was dedicated in 1886, so you will find her completion date on the piece, as well. Stop back tomorrow for another peek!